Nausicaa of the Valley of the Wind is a remarkable and unique anime replete with religious and spiritual imagery. We will attempt to demonstrate here that Nausicaa is every bit as much an allegory of the sacrificial nature of God the Daughter as the Narnia stories are of the Christian mythos. The most serious objection to this thesis is, of course, that the director nor anyone else involved it likely to be aware of the mythos of God the Daughter. Our answer to this is that this mythos is universal. It exists always and everywhere in the human heart because it is the Truth that underlies our very being. It can take different forms in different times and places, as we have explained elsewhere, but in the quasi-post-Christian culture of the modern world, that of the Sacrificial Daughter is probably the crucial one. We use the expression "quasi-post Christian" because Japan, for example, is not actually a post-Christian society but is so imbued with Western imagery that it responds to the themes of Christian religion – but in ways that are not tied to Christian dogma. 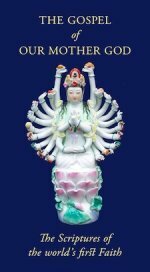 Consequently the theme of the Sacrificial Deity, epitomized by such feminine figures as Ishtar and Inanna long before Christianity hammered it into the patriarchal mold for the West, can very easily revert to its true form in the Japanese mind. The religious imagery in Nausicaa is clearly apparent, indeed, Hayao Miyazaki-san, who both wrote the original manga and directed the anime, harshly criticized his own work because the ending looked "religious". Miyazaki-san was at the time a lifelong Marxist who strongly opposed all religion. However, within a few years of Nausicaa he renounced Marxism and began to open up toward spirituality. He gave as the reason the fact that working on Nausicaa had required him to think about the deeper philosophy of life. The "religious image" that caused the Marxist Miyazaki-san to be so harsh on his work was the Resurrection Scene at the end of the anime. However, other religious aspects of Nausicaa are equally striking. She is almost completely dedicated to the principle of ahimsa, non-harm. She will not fight or hurt anyone, except on the notable occasion when her father is murdered. This only serves to show that she is indeed a formidable warrior and refuses to fight by choice. Her non-warlike nature is certainly saintly, and requires far more courage than the easier path of battle. Immediately before she becomes badly injured in the scenes leading up to her death, she spreads out her arms against the sky in a crucifix formation, to indicate her peaceful intentions (see picture at top of page). When, terribly weak and wounded, she asks the Ohm to forgive "us" (the name "Ohm" is represented by the kanji 王蟲 – the characters meaning both "king" and "insect", but the pronunciation is unusual and reflects the primordial sacred syllable, OM) she is, indeed, the only human who has done the Ohm no harm at all. But she is taking upon herself the sins of the world immediately before her death. After her death, she is resurrected by the Ohm, and the blind seer Obaba asks the children to describe the scene to her. On hearing the children's description, she immediately recognizes that Nausicaa is indeed the promised Messiah, robed in blue (the color of the Virgin Mary), coming over fields of gold. There are many other aspects of the anime that identify Nausicaa as an allegory of the Sacrificial Daughter, but several will immediately strike a deep and resonant chord with devotees of The Mythos of God the Daughter in The Gospel of Our Mother God. 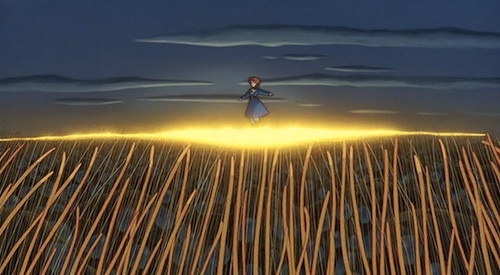 The scene in which Nausicaa is sucked down by the quicksand into an under-world, in which she discovers the secrets of the world's pollution and its possible cleansing clearly reflect the Daughter's journey into the Nether World. Now from the time when the Daughter of Heaven had passed through the first gate of Hell, a barrenness had fallen on the earth; and neither bird had sung nor any flower showed its beauty forth; nor was there joy in any heart. 2. But when the Maid was slain upon the pillar of the world, an awful darkness fell on all the earth. 3. And the rivers of the earth ceased to flow, but drained away into the salt sea, and the sea ceased to move, but stood still in awful stagnancy. 4. And there was drouth in all the earth. And neither maid bore child nor ewe brought forth the lamb. And every growing thing began to wither from its roots. 5. And in the nights were neither moon nor stars, and the heat of the sun by day was terrible. The rescuing of the Waste Land, is an ancient theme that has (for reasons we shall not discuss here but to which we hope to return) after long dormancy in the West, come to the fore in the 20th century, beginning with T.S. Eliot's The Waste Land and continuing notably with The Lord of the Rings and practically every video role-playing game ever made. The Waste Land theme is an integral part of the story of the Sacrificial Deity, but one that is not represented in the Christian mythos. It has returned strongly to the Western psyche in the 20th century, and in Nausicaa is returned to contiguity with the Story of the Daughter. 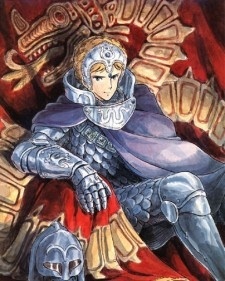 Another fascinating aspect of the anime for readers of the Mythos of God the Daughter is the figure of Princess Kushana. She plays the role of the Anti-Daughter, who, in the Gospel, is the Dark Queen. 57. Evil must needs arise and be triumphant, and the dark mistress have her night of power. 59. For she is the dragon that doth devour her children and casteth her servants into the lake of fire. Nausicaa of the Valley of the Wind is a remarkable production that may well be seen as doing for Filianists what Narnia did for Christians. It is a fascinating revelation of the way in which the True Faith lies dormant within the souls of all beings, waiting only to be awakened by a spark of unfettered imagination. Do you worship Our Mother God? Metaphysical Commentary on "Mother Holle"